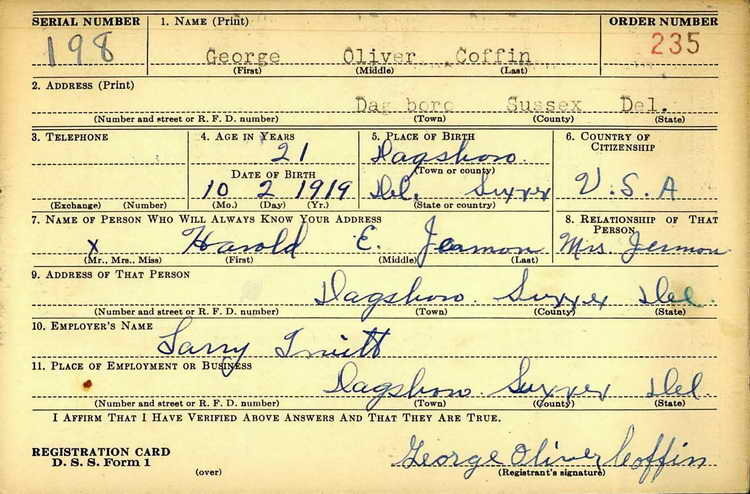 George Coffin registered for the draft ca. 1940. He enlisted in the Army at Trenton, NJ on 6 January 1941. TSgt Coffin was transferred from the 82nd airborne Division to Service Company, 508th PIR on 29 September 1944. He was subsequently transferred to Company E on 8 December 1945..
On 9 January 1945, TSgt Coffin was evacuated to a field hospital and classified as a "non-battle" casualty. He returned to duty on 28 February 1945. His military decorations include the Combat Infantryman badge awarded for action during campaign, 18 Dec 1944 to 20 Feb 1945.